Priced at $397k, the top-of-the-line Rezvani TANK Military Edition boasts Ballistic Level 7 armoring, gas masks, underside explosive protection, and military run flat tires. On the inside, you’ll not only find first aid kits, but an intercom system that can be used to safely communicate with people outside the vehicle, along with strobe lights, a Kevlar-wrapped fuel tank and ‘blinding lights’ to disorient attackers. It’s powered by a supercharged 6.2-liter Hellcat V8 engine that develops 707 hp, riding on a reinforced suspension. Click here to view the first image in today’s viral picture gallery. Continue reading for the five most popular viral videos today, including one where an NSA hacker reveals five ways to protect yourself online. NVIDIA researchers has developed a new artificial intelligence-powered system that automatically removes noise, grain, and watermarks from photos. “Recent deep learning work in the field has focused on training a neural network to restore images by showing example pairs of noisy and clean images. The AI then learns how to make up the difference. This method differs because it only requires two input images with the noise or grain. Without ever being shown what a noise-free image looks like, this AI can remove artifacts, noise, grain, and automatically enhance your photos,” said NVIDIA. Click here for the first image in today’s viral picture gallery. Continue reading for the five most popular viral videos today, including one of a functional iPhone X lighter case. MIT graduate student Arnav Kapur has developed “AlterEgo,” a head-worn device that works when the user internally vocalizes a specific command or question. Electrical signals that your brain normally sends to the vocal cords are then intercepted and sent to a computer, which communicates with the user’s inner ear through vibrations. No word yet on if this technology will eventually be commercialized. Click here for the first image in today’s viral picture gallery. Continue reading for the five most popular viral videos today, including one of the most expensive machines in the world. What better way to knock drones out of the sky than with a dune buggy equipped with a high-energy laser weapon? That’s exactly what Raytheon has created. To be more specific, the team combined a high energy laser with an advanced variant of Raytheon’s Multi-spectral Targeting System – a sophisticated package of electro-optical and infrared sensors – and installed it on a Polaris MRZR, a utility terrain vehicle. “Basically, we’re putting a laser on a dune buggy to knock drones out of the sky,” said Dr. Ben Allison, director of Raytheon’s high energy laser product line. Click here for the first image in today’s viral picture gallery. Continue reading for the five most popular viral videos today, including one showing how movies get vintage and custom cars. The Nintendo Switch is a fine game console, but for some gamers, the Wii still holds a special place in their hearts. The latter is true with modder “GC64”, who decided to skip the newer console, and build a portable Wii, called the “WiiBoy XL”, instead. Featuring an OMGWTF trimmed Wii motherboard, four 18650 rechargeable batteries, a single cord charge + play system using a standard 12v DC adapter, GC+ with sliders, a custom 3D printed case, 4-inch 4:3 composite display, and games loaded on an SD card. Click here for the first image in today’s viral picture gallery. Continue reading for the five most popular viral videos today, including one of eight credit card-sized gadgets. There’s the all-electric Tesla Model S, and then the sleek Q30 electric motorboat by Q Yachts. It’s powered by an electric propulsion system known as Ocean Volt, which consists of a 20kW motor and 30kWh battery for an ultra smooth ride. The hull is hydro-dynamically optimized to ensure passengers do not experience motion sickness, while still maintaining zero emissions, thanks to a noise-free propulsion system. Climb beneath the deck, and you’ll find plenty of seating for a quick snooze or just some relaxation time. Click here for the first image in today’s viral picture gallery. Continue reading for the five most popular viral videos today, including one showing how sound effects for horror movies are made. MIT’s newest robot, the Cheetah 3, is unlike any of its predecessors, as it can now easily leap, gallop across rough terrain, and even climb a staircase littered with debris. When suddenly yanked or shoved, it can quickly recover its balance, all the while essentially blind, thanks to new vision-free algorithms. “The contact detection algorithm helps the robot determine the best time to transition a leg between swing and step, by constantly calculating for each leg three probabilities: the probability of a leg making contact with the ground, the probability of the force generated once the leg hits the ground, and the probability that the leg will be in midswing. The algorithm calculates these probabilities based on data from gyroscopes, accelerometers, and joint positions of the legs, which record the leg’s angle and height with respect to the ground,” according to the researchers. Click here for the first image in today’s viral picture gallery. Continue reading for the five most popular viral videos today, including one of nine nut cracker gadgets you can actually buy. 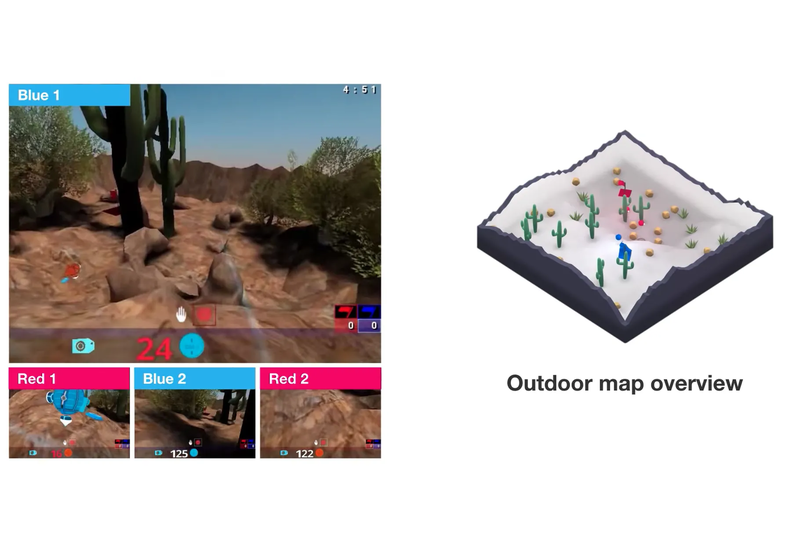 First, OpenAI’s bots were trained to defeat human opponents in DOTA 2 (bottom video), now, Google’s DeepMind AI has exceeded human-level gameplay in Quake 3. The DeepMind agents go into the game without any instructions, and then start competing against themselves until they develop winning strategies – an AI agent plays against an identical clone. Well, the research team went above and beyond by training 30 agents in different play styles. It took nearly half a million matches each lasting five minutes, to train the agents to exceed human-level gameplay. Click here for the first image in today’s viral picture gallery. Continue reading for the five most popular viral videos today, including one ten life hacks for summer. The ZKZM-500 Laser Assault Rifle by China-based Xian Institute of Optics and Precision Mechanics was modeled after the AK-47, but unlike its low-tech counterpart, this weapon is accurate up to 800-meters away and causes ‘instant carbonization’ of human skin. It’s also capable piercing through metal gas tanks to ignite the fuel within, while remaining completely silent and with an invisible beam to boot. On a full recharge, you’ll reportedly be able to fire up to 1,000, 2-second bursts. Click here for the first image in today’s viral picture gallery. Continue reading for the five most popular viral videos today, including one of the darkest Disney fan theory ever. Scientists have managed to use ESO’s Very Large Telescope (VLT) to capture the first confirmed image of a planet caught in the act of forming in the dusty disc surrounding a young star. This planet is carving a path through the primordial disc of gas and dust around the very young star PDS 70, which suggests that the planet’s atmosphere is cloudy. “These discs around young stars are the birthplaces of planets, but so far only a handful of observations have detected hints of baby planets in them. The problem is that until now, most of these planet candidates could just have been features in the disc,” said Miriam Keppler, who lead the team behind the discovery of PDS 70’s still-forming planet. Click here for the first image in today’s viral picture gallery. Continue reading for the five most popular viral videos today, including one of the ultimate Hot Wheels GoPro challenge.